Riding since age seven, Alexis has been a student of horsemanship all her life. She began her education in the hunter and equitation rings learning from long time mentor Carol Goodstein of Springdown Equestrian Center. In 2002 Alexis started her training business and earned her certification as a level 4 instructor from the Certified Horsemanship Association. She also completed horse and barn care as well as management courses at Sierra College. After dabbling in many different disciplines she feels most strongly for dressage. While running her own training business she coached the UC Davis Intercolliegiate Dressage team for 4 years. Under Alexis' enthusiastic instruction, her riders qualified for and competed to top ten placings in the Intercolliegiate National Championships. Later, during a 3 year employment at Sandy Savage Dressage, Alexis gained hands on experience in care, management and riding of competition dressage horses of all levels. Also while working with Sandy she earned her USDF Bronze medal aboard her self trained Thouroughbred rescue horse, Crescendo. Since 2011 Alexis has been the in house trainer for the Pure Spanish Horses of Dorado Andaluz. 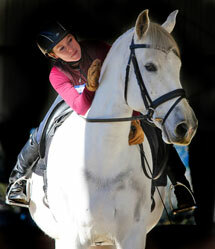 During that time she has earned her USDF Silver and Gold medals. Most recently, she has participated in clinics and teacher trainings with Mary Wanless on rider biomechanics and on teaching.